In the next instant, he flicked a crystal, the size of teardrop, toward the water. 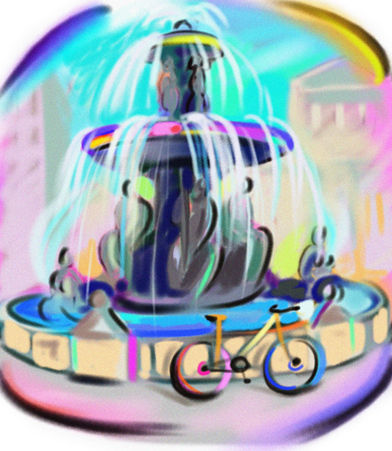 Then, feet planted against the skateboard, Jack whirled away from the fountain that filled rapidly with soap bubbles. “You!” A gruff voice called. Jack glanced up to see a security man on horseback frowning down at the sudsy mess. A secret smile tugged at the man’s lips. He means me. Jack smirked. Crouching low, he spun around the corner to where the trees danced with white and orange lights. The pungent scent of pumpkin pie spice tickled his nose as he rolled by a store front. Behind the plate-glass window, fairy dolls dangled from wire branches of makeshift trees as if the nymphs floated on the autumn air. He wasn’t supposed to be here. But being naughty was what Jack loved best. Francesca felt worn out and sad as she hurried by a sign posted at the side of the street. It read: NO SKATE BOARDS ALLOWED! The air was muggy at best. Not the crisp chill most would affix to Halloween twilight. To escape her bad mood and the strangely warm evening, she ducked inside a corner boutique where sultry dresses hung behind the plate-glass window front. A jingle of chimes at the door made it seem like she stepped inside another world. The artificially generated air wove a current, cool and inviting around jewelry that sparkled from wire stands. Behind the sales counter there stood a diminutive fairy. When she turned, her silvery hair cascaded like ripples from a waterfall to caress her tiny waist. Francesca noticed a flash of someone passing by the window, followed by a sparkle of golden light that lingered in the air. Something like magic drew her outside toward the children splashing in the fountain. She stopped at water’s edge, longing to kick off her shoes and dip her toes into the water. At that precise moment, someone took her by the hand, hauling her sideways. Her breath caught in her chest as she glanced up to see a young man on a skateboarder. His longish red hair jagged up like lightning from his head. A twinkle of mischief lit his wild green eyes. Was it her imagination or did she see small peaks at the top of his ears? Like an elf! Before Francesca could think another thought or even catch her breath, she found herself running beside him. Much to her surprise, she kicked off her shoes and jumped on the back of his skateboard. Image above from Word clip art. 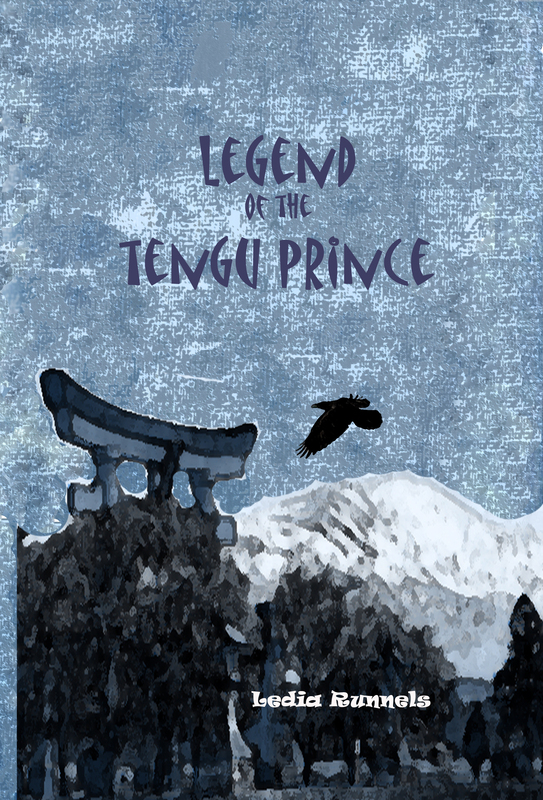 Legend of the Tengu Prince — Finally Available on Amazon.com! Fantasy Action Adventure set in feudal Japan. During a time of civil war, Karasu Hinata is born the son of a powerful warlord. When he is still a child, his family castle is taken by a rival clan. His father and mother are murdered right before his eyes. Barely escaping with his life, he is spirited away by the king of the tengu. The shape-shifting raven leads him to the hidden mountain retreat of a sect of mystic warriors. Mountain priests who practice the magic of Shugendo. Ten years have passed. The time has come for Karasu to leave the mystic’s protective lair and face his demons in the world beyond. But the fiend that haunts his nightmares is also the one that shattered his life. More than a bad dream, it wants him dead. In Legend of the Tengu Prince, nothing is as it seems. Shape-shifting creatures, both good and evil, populate the magical world of feudal Japan. And a young man will pay the ultimate price for a deadly rival spawned in the mists time. This riveting first volume of a epic fantasy adventure will leave you stunned and begging for more. Throwing rocks to ripple in the pond, he waited. Any moment now and the portal would gape open. It began as a tiny light twinkling the same way a star appears from outer space, but spread like a wild-fire until it glowed as tall as Jack’s head and wide as his shoulders. Jack stepped closer. For a moment, he stood waiting at the edge of his world. An uncomfortable feeling grabbed at his chest. A shiver of apprehension tracked through him. He tilted his head in contemplation, peaking outside where the ball of fire in the sky, they called it the sun, was an orange smear across the darkening sky, making the dirt of the other world look that much dingier, Jack grimaced. Tossing his head back, he snapped his fingers and a board with wheels appeared in his hand. He spun a wheel with one finger, a devilish smile lifting one side of his lips. He took a deep breath and dove head first through to the other side. Sliding by on his skateboard, the sound of happy laughter drew Jack like a witch’s spell. He spun around a corner of the market place to find children stomping and splashing in a shallow fountain. Blue, green, orange and pink lights glistened up from beneath the water to shine on the little one’s faces. Adults gathered at the edge of the pool. Among them sat a woman in tapered, cream-colored slacks. Her golden hair blew every so slightly in the evening breeze. It was the look on her face that bothered Jack the most, superior and smug as if she was too good to stand among the common folk. She narrowed her blue gaze toward a slightly plump, smaller woman who had the audacity to get in bare feet and ankle-deep with a little boy. Hands beneath the child’s arms, she swung him just above the splashing water. The little one’s squeals of joy made Jack’s heart swell with happiness. The fairy knelt low. He could disappear with just a thought. 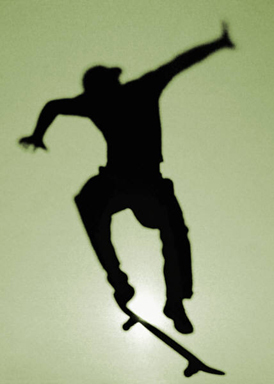 The wheels of the skateboard he rode whirled, blending with the chirping of crickets. Smooth as butter, Jack picked up a rock from the ground. He gave it a toss so the smooth stone landed exactly where he wanted it. It hit the puddle of mud just so. A stream of the black gunk splattered from knee to ankle on the haughty woman’s not-so-perfect-now cream slacks. A bubble of laughter started in Jack’s throat. He doubled over, slapping his knees, yet never once did he teeter the slightest bit off the board on wheels. The woman jumped to her feet. A scream of horror tore her perfect face. Now we’re having fun, Jack smirked. The little boy swinging from his mother’s hands gazed wide-eyed in the fairy’s direction. Of course you know me. Jack gave the child a wink. Several weeks later, Jenny stood with him beside the front door of a house he had never seen. His suitcase gripped between bone-white fingers, he squinted down at a tiny crack in the concrete porch beneath his feet. His feet felt as if they stood in hardening cement. He couldn’t move even when he heard the door creak as Jenny pushed it open. Obediently, he followed the back of her brown, leather shoes over the threshold. When they stopped, he stopped just inside the foyer. The scent of raisin, oatmeal cookies, just baked, filled his nose, making his mouth water as Jenny’s shoes disappeared, replaced by a pair of pink-glittered ones looped with white laces that pointed directly toward him. Slowly, he raised his gaze to the girl’s blue eyes. Dark hair framed her pale face. “It is,” said Jenny, from the kitchen where she stood next to a smallish woman with blue eyes and dark hair like her daughter’s. Jenny cocked her head to one side, giving him and the girl a playful wink. The girl’s face beamed toward him as she took his hand between her warm fingers. “I’m Maggie. I’ll show you to your room. It’s just down the hall, this way,” she sang out, guiding him toward the back part of the house. As they passed the sliding glass door in the family room, he saw the backyard where a trampoline stood next to a porch swing, and a built-in barbecue pit. On the other side of the wooden fence, the woman watched through dark-colored glasses. Her rust-brown hair pulled into a messy ponytail beneath a black and gray striped ball cap. “Leave them alone,” he whispered and narrowed his eyes in warning, though she stood too far away to hear him. A strong gust of wind blew the ball cap off the woman’s head and she stepped back to retrieve it. Then she melted into the forest that grew a short distance away. 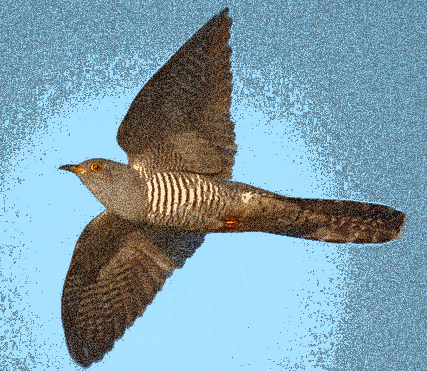 A moment later, the cuckoo bird flew out from the same place the woman disappeared only moments before. The striped bird flew into the sky. When it did not return, he heaved a fleeting sigh of relief. At the door to what would become his room, the girl rushed in and returned holding a set of acrylic paints and a paper pad out to him. She chirped, “Jenny said that you are an artist. What types of pictures do you like to paint? I like to draw birds, all kinds of birds.” The girl seemed to talk nonstop, barely taking a breath between sentences as she swung her body to and fro. He took the offered gifts and smiled, genuinely happy for the first time since the baby magpies flew away. That night he dreamed that the terrible cuckoo bird transformed into an angel, dressed all in white with flowing black hair and gentle blue eyes. And he knew upon waking that humans could decide their own fates. Only the birds and the beasts of the earth must follow instinct alone. Hope you enjoyed the story! Image above from “European Magpie” http://en.wikipedia.org/wiki/File:Pica_pica1.jpg manipulated with Photoshop filters. Every day after that, he and Jenny kept the tiny, green-blue and speckled eggs warm. And every day he stood beside the picture window, watching the black banded cuckoo. Perched in the nearby trees, it kept a militant watch over her banded baby that sat with greedy mouth open in the magpie’s nest. 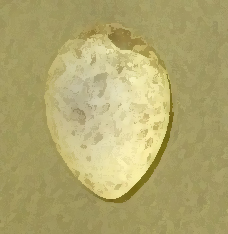 Until, one day, a tiny fracture appeared from inside the first green-blue egg. Another and another quickly followed as a naked birdling with blind eyes flopped out from between the cracked shell. 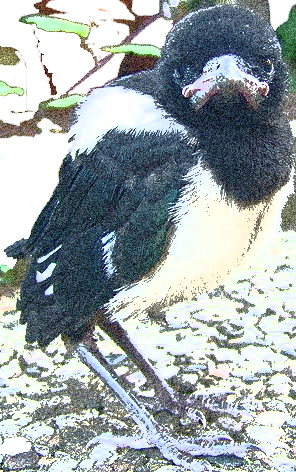 The second infant magpie hatched soon after. Feeding the babies all the right food and doing all the right things, he and Jenny soon took the two fledglings, fat black and white with blue iridescence on the lower edge of their wings, to the open window beside the pine tree. Their now empty nest lay in tatters by force of wind, rain and a belligerent cuckoo. He released his fingers and gave the toddler a gentle nudge. Spreading its wings, the young bird lifted toward the pine tree. Along with its sibling flying free from Jenny’s out-stretched palm, the magpies made the sky their own. Jenny stood beside him, squeezing his hand with her warm fingers laced between his. Happiness swept through him like warm butter until he saw the woman standing a short distance away, her rust brown hair fluttering curly and loose in the late spring breeze. Suddenly he wanted to cry as the all too familiar, sickly sweet sensation rushed over him. In the ten years since his mother had left him wrapped in the drab blanket and screaming on the orphanage doorstep, four families had taken him home. They explained, hands twisting in guilt and frustration, that it was his bizarre behavior followed by the terrifying images of crazed birds painted on the walls and sidewalks that made it impossible for them to let him stay. “They’re just cuckoo birds and can’t help how they are,” he tried to explain his drawings, but to deaf ears. From gossiping tongues, the stinging words taunted him about how each family that gave him back, had then suffered a tragedy. “Because of me?” he sobbed into his pillow, tasting salty tears, streaming into the cracks between his pinched-closed lips. Now, standing beside the open window, his gaze shot toward Jenny’s round, honeyed face. “No. No. Don’t,” he pleaded and turned to run back into the bowels of the orphanage, while the baby magpies soared toward the forest canopy and out of sight. Two weeks later, he watched the nest in the pine tree as much as possible between middle school classes and sleeping. He stood nibbling on the crust of a Ukrainian pyrizhky (piroski), stuffed mushroom fried pie the day he saw the hatched cuckoo shove the magpie’s eggs out of the nest made from small branches, twigs, and vegetation stuck together with dried mud. Each egg, light green-blue with brown speckles, made a soft plunk as it fell to the forest floor. A section of blue blanket gripped in his hands, he hurried to the place where the pine tree’s roots bowed up from the ground beside two unbroken eggs and two that lay shattered against tiny stones scattered in piles of dried pine needles beneath the tree. He knelt in the damp earth and tenderly lifted each unbroken egg between his thumb and index finger, gently laying them between the layers of downy cotton. Cradling the undamaged eggs, he looked up at the blue sky, toward the mother magpie that soared toward her nest where the cuckoo fledgling sat, bill wide open and hungry. The magpie’s black and white with iridescent blue feathers glistened in a stream of sunlight that trickled through the tallest tree branches, her long feathery tail fanning out behind her. His heart ached for the mother bird, forced to raise the murderous offspring of a sociopath while her own chicks died in embryo. Gazing down at the undamaged eggs that lay snug in the blanket between his small hands, he vowed to raise each baby bird so well that someday they could return to the forest. He would do this for them and for their mother. Bust most of all, he would do it for himself to prove everyone wrong. Animals might act on instinct, but humans could rise above their origins, regardless of how low. He would show them how. Warm fingers stroked his hair waking him from deep sleep. Through half-closed eyes, he observed Jenny, the night attendant at the orphanage. He propped himself up on one elbow as she squatted to his eye level. A smile spread across her round face surrounded by a chestnut bob all the way to her forest green eyes that glistened in the moonlight shining through the window beside his narrow bed. She stood to her feet, fists planted on each hip, a determined lift to her chin. “Not yet.” Then she gave him a conspirator’s wink. Now, the remnants of the last spring rain trickled from the tattered gray sky, splattering against the picture window where he stood. A pair of cheap binoculars pressed to his eyes. The whitewater rumble of the creek made the dense forest feel like the wilderness though the orphanage stood near a suburb outside of Kiev. The bright magenta foliage of a lilac tree showed stark against the otherwise drab landscape. While in the distance, a clap of thunder boomed as the storm moved toward where he stood. He adjusted the binocular’s focus as he studied the bird that measured over a foot long from its yellow-black bill, rust-brown upper parts and black bars running across drooped wings to its raised tail. Perched on the branch of a pine tree near the water’s edge, the bird’s golden eyes darted this way and that on the lookout for the magpie in whose nest she had recently laid a single, speckled-drab egg. Kneeling on ripped-jean-covered-knees, he sketched black, yellow and red images on the park sidewalk. From the corner of his eye, he noticed the tallish woman. Dressed in a black cloak over gray slacks, she stood within a tiny copse of trees a short distance away. He knew she watched him from beneath the black hood that covered her rust-red hair. It wasn’t the first time he had seen her. When he looked again, she hovered close. Her golden gaze swept over his narrow shoulders, focused on his masterpiece. When she said this, he smiled up at her. Their gazes caught in the gentle breeze that blew between them. Pleased, he made a small adjustment to the drawing, the red chalk biting into the concrete as icy fingertips lightly stroked his hair. Startled, he looked over to find the space empty beside him. He shivered as the cool breeze suddenly turned cold. “Goodbye my little kukushka,” The wind seemed to whisper in his ear. Image above from http://en.wikipedia.org/wiki/File:Cuculus_canorus_vogelartinfo.jpg manipulated with Photoshop filters.